Bharatiya Janata Party (BJP) is fully geared up for the upcoming Lok Sabha polls. They have set their eyes on the young voters and are speaking of their needs such as employment. More than 150 million of these first-time voters played an important role in giving additional seats to the BJP in 2014 elections. 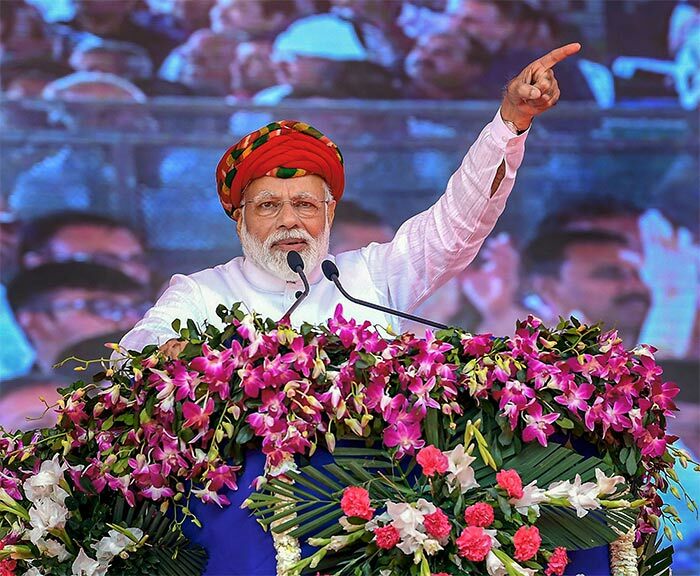 Prime Minister Narendra Modi at a public rally in Churu, Rajasthan, Tuesday, February 26, 2019. This was his first rally after after strikes by the Indian Air Force across the Line of Control. PM Modi said the country is in safe hands and that he will not let the country down. 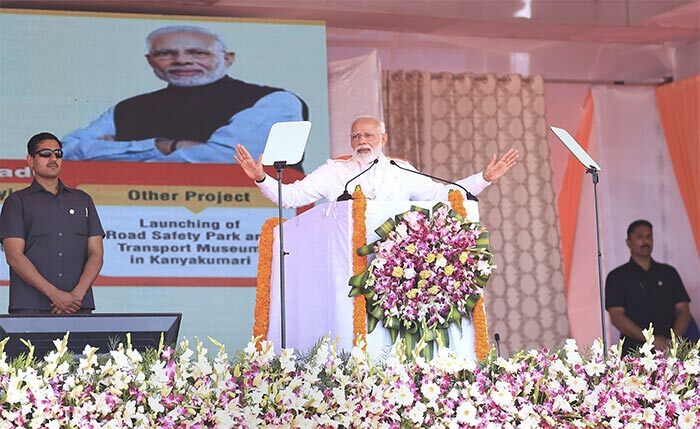 PM Modi during a programme for the launch of various development projects, a road safety park and a transport museum in Kanyakumari, March 1, 2019. Here he applauded Wing Commander Abhinandan Varthaman for his bravery. This was the first time that the Prime Minister directly spoke about the IAF pilot who had been in Pakistani custody at that time. 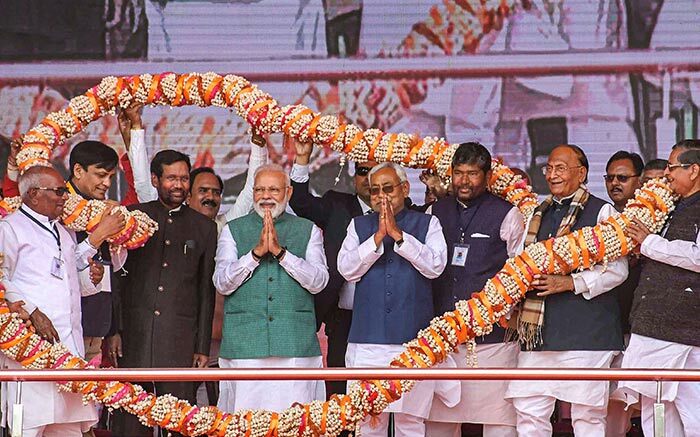 PM Modi with Bihar Chief Minister Nitish Kumar, Union Minister and LJP chief Ram Vilas Paswan being garlanded during 'Sankalp Rally' at Gandhi Maidan in Patna, March 3, 2019. Here, PM ripped into the Congress, accusing the party of providing ammunition to Pakistan with its criticism of the government over the air strikes in Pakistan's Balakot. 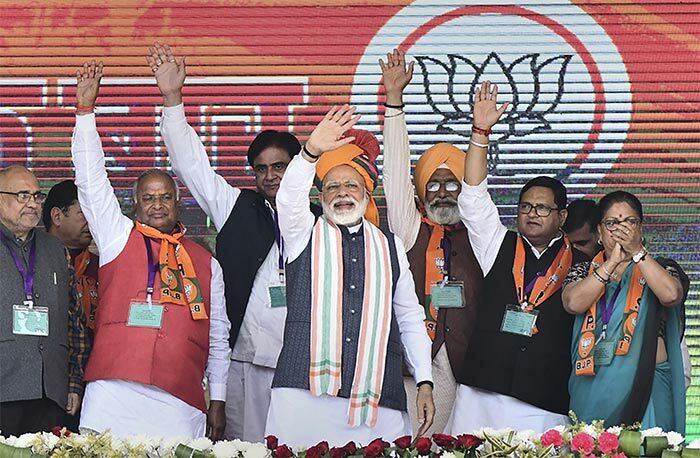 PM Narendra Modi waves at his supporters during a public rally and launches several development projects, in Amethi, March 3, 2019. 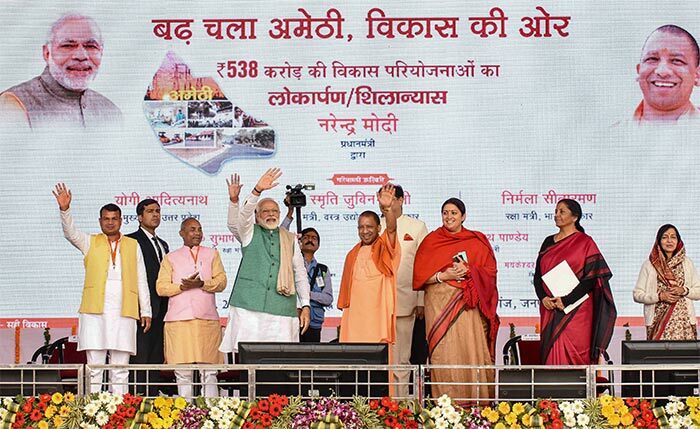 Also seen are Uttar Pradesh Chief Minister Yogi Adityanath, Union Ministers Smriti Irani and Nirmala Sitharaman. PM Modi speaks at the inauguration of the various development projects, in Jamnagar, Gujarat, March 4, 2019.